Toshiba recently added two new sub-$100 Blu-ray players to its line, the BDX2150 ($79.99) and BDX-2250 ($99.99). The primary difference between them is that the higher-priced model includes integrated WiFi. We have not performed a hands-on review of the BDX2150, but here is a more comprehensive look at its features. The BDX2150 is not a 3D-capable player, but it does include access to several Web-based services: Netflix, CinemaNow, Blockbuster On Demand, VUDU, YouTube, and Pandora. The player also supports media streaming from a network-connected server. 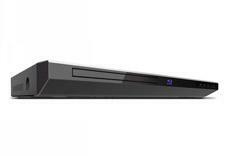 • Read more Blu-ray player reviews by Home Theater Review's writers. • Find a Plasma HDTV or LED HDTV to pair with the Toshiba BDX2150 Blu-ray player. The BDX2150 supports playback of BD, DVD, CD audio, AVCHD, WMA, MP3, and JPEG files. The connection panel includes four ports: HDMI, coaxial digital audio, Ethernet, and USB. There are no analog outputs on the video or audio end. The player has onboard Dolby TrueHD and DTS-HD decoding, and it can pass both of these high-resolution audio formats in their native bitstream form over HDMI, for your A/V receiver to decode. You can add the player to your home network either by using the back-panel Ethernet port or by adding the optional USB WiFI adapter (the WLM-10UB1, $49.99). The player lacks internal memory to store BD-Live content, so you must add storage via the USB port. Because you need the USB port for storage, if you add the USB WiFi adapter for network connectivity, you can't access BD-Live content. The USB port also supports media playback. The player lacks advanced control ports, such as RS-232 or IR. Read about the high points and low points of the BDX2150 Blu-ray player on Page 2.